Wyndham Grand Agra ( A Unit of Shekhar Resort Ltd) located in the city of Taj, has been built on 18 acres of land with a large frontage. A beautiful hotel property inspired by the intricacy of Mughal architecture with splendid display of terraced lawns, fountains and ancient interiors that take you back to an era of emperors and princes with the modern facilities. It is a masterpiece of architecture built on 'Mughal Theme' with world class modern hi-tech amenities. It is attracting leisure & business tourists from all over the world. The easy to approach location is another big advantage. The royal ambience, the intricate craftsmanship and the beautiful landscape makes it the most preferred destination in the itinerary of tourists. A visual delight for holiday makers as it revives the grandeur of the Mughal Emperors. Wyndham Grand Agra is perfect for an extended break with its idyllic settings, perfect location and world–class amenities. 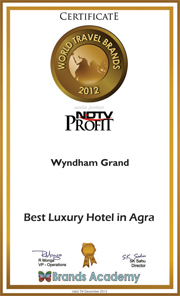 The hotel Wyndham Grand Agra has 160 spacious suites and rooms. It offers many leisure options, including a large swimming pool and a luxury spa. The hotel has a variety of dining luxury options, The Orient Café, Jharokha, Pakhtoon, Zaiqa serve authentic Mughalai , Indian and international cuisines. While Mharo Gaon, the Rajasthani theme speciality restaurant is one of the major attractions in the city. Experience the heavenly beauty of Agra in all its tranquil glory. Recreated to awaken and rejuvenate your senses … to make you experience pure bliss. The Hotel has a large frontage with splendid view from the main road.Due to close proximity, the Taj Mahal can be viewed from the roof of our Hotel. • Agra’s largest swimming pool with a submerged Pool Bar.